Novel generations of functional assays such as gamma interferon (IFN-γ) ELISpot, which detect cytokine production at the single cell level and provide both quantitative and qualitative characterization of T cell responses can be used to assess cell-mediated immune responses directed against varicella zoster virus (VZV). Salem Fourati, I., Grenier, A. J., Jolette, É., Merindol, N., Ovetchkine, P., Soudeyns, H. Development of an IFN-γ ELISpot Assay to Assess Varicella-Zoster Virus-specific Cell-mediated Immunity Following Umbilical Cord Blood Transplantation. J. Vis. Exp. (89), e51643, doi:10.3791/51643 (2014). First performed in 1989, UCBT is increasingly used as part of the treatment of various neoplastic and nonneoplastic blood disorders in children1. VZV is a cytopathic human alphaherpesvirus which causes two different diseases, varicella (after primary infection) and herpes zoster (after reactivation). Following primary infection, VZV persists throughout the life of the host sheltered within sensory nerves of dorsal root ganglia. One of the most threatening infectious complications following UCBT is associated with VZV2-4. In our clinical center, in absence of VZV prophylaxis, the cumulative incidence of VZV disease VZV disease at 3 years postUCBT was 46%2. In these patients, de novo infection with or reactivation of VZV is often associated with visceral dissemination to the central nervous system, lungs and liver5-7. As a result, acyclovir, valacyclovir or famciclovir prophylaxis is commonly administrated to UBCT recipients8,9. However, this treatment strategy does not take into account the protective potential of VZV specific T lymphocytes or the kinetics of reconstitution of VZV specific T cell responses. Potential problems associated with the expanding use of long term antiherpetic prophylaxis include a) patient overtreatment; b) the development of antiviral drug resistance10,11; and c) impairment of VZV specific immune reconstitution12,13. Because detection of functional VZV specific T lymphocytes correlates with the presence of long term protection from VZV infection and improved clinical outcome4,14,15, monitoring cell mediated immune responses directed against VZV during the posttransplant period might result in a more rational use of antiviral treatment by enabling medical practitioners to distinguish patients who would benefit from VZV prophylaxis from those whose immune system is capable of controlling VZV replication4,13. The IFN-γ ELISpot assay is widely used for the monitoring cell mediated immune responses in a variety of experimental systems and clinical conditions. Spots are generated following the cleavage of a chromogenic substrate, generating a visible and stable precipitate at the site of the reaction. Each individual spot thereby represents the footprint of an individual cytokine-producing cell. IFN-γ ELISpot not only measures the ability of individual cells ex vivo to produce IFN-γ in response to in vitro stimulation with cognate antigen, but it also provides an estimate of the frequency of responding cells in a given cell population16,17. In addition to its high sensitivity, IFN-γ ELISpot is straightforward to perform, making its use possible in the context of personalized clinical protocols aimed at guiding initiation or cessation of antiviral treatment. The procedure detailed below describes an ELISpot assay that is specifically designed to detect and measure the production of IFN-γ by peripheral blood mononuclear cells following in vitro stimulation with VZV derived antigens. This research protocol was approved by the Institutional Ethics Review Board of CHU Sainte-Justine, Montreal, Quebec, Canada, where the study was conducted. Informed consent was sought and obtained from all study participants, their parents or legal guardians. All procedures performed on days 1 and 2 must be carried out under sterile conditions (i.e. under a laminar flow hood). Standard safety procedures for handling human blood should be strictly observed. Permeabilize the polyvinylidene difluoride (PVDF) membranes at the bottom of 96 well MultiScreen IP white ELISpot plates by adding to each well 20 μl of 35% ethanol for 1 min. Membranes should become slightly translucent. Immediately wash the wells 3 times with 200 μl of 1x phosphate buffered saline (PBS; 137 mM NaCl, 2.7 mM KCl, 10 mM Na2HPO4, 2 mM KH2PO4, pH 7.4) using a multichannel pipette or similar device. This step is critical given that ethanol residues can affect cell viability and binding of capture antibody. ELISpot plates are fragile and should be handled carefully: the use of an automated plate washer is not recommended. Coat the wells with 10 μl of purified mouse anti-human IFN-γ capture antibody diluted in 1x PBS to a final concentration of 10 μg/ml. Cover the plates with regular plastic wrap and incubate overnight at 4 °C. Empty the wells, tapping them dry, and wash plates 5 times with 200 μl of 1x PBS. Fill the wells with 200 μl of complete RPMI 1640 medium and incubate plates for 2 hr at 37 °C (blocking step). Wash the plates 5x with 200 μl of 1x PBS and keep the wells full of 1x PBS until cells are ready to be plated. Prepare peripheral blood mononuclear cells (PBMC) from human venous blood samples by centrifugation on Ficoll-Paque gradients using standard procedures. Alternatively, using standard methods, thaw aliquots of PBMC frozen under liquid nitrogen. After the last centrifugation, resuspend cells at a final concentration of 2 x 106 cells/ml and incubate overnight at 37 °C under a 5% CO2 atmosphere in a water jacket incubator. Remove PBMC from the incubator and resuspend them in a final volume of 5 ml of complete RPMI 1640 medium. Incubate PBMC in the presence of 10 μl of genetically engineered endonuclease from Serratia marcescens for 5 min at room temperature. Remove a 50 μl aliquot of PBMC and mix with 50 μl of trypan blue dye. Count cells and estimate % viability using a haemocytometer and microscopic examination (dye exclusion method). Various automated methods for cell counting and assessment of cell viability can also be used. PBMC should be >95% viable. Discard sample when viability is lower than 95%. Centrifuge PBMC at 700 x g for 5 min, discard supernatant, and resuspend cells in AIM-V medium supplemented with 2% (v/v) inactivated human serum (HIS) at a final concentration of 2 x 106 cells/ml. Keep at 37 °C until stimulation mixtures are added to the plate. Use AIM-V medium supplemented with 2% (v/v) inactivated human serum (IHS) as negative control. Use anti-CD3 monoclonal antibody (clone OKT3) diluted in AIM-V medium supplemented with 2% (v/v) IHS to a final concentration of 0.5 μg/ml as positive control). Use VZV antigen, in the form of either γ-irradiated (10,000 Gy; 30 min exposure time) live attenuated VZV vaccine (1,350 plaque forming units [PFU]/ml) diluted 1:200 in AIM-V medium supplemented with 2% (v/v) IHS) or 1 μg of an equimolar mixture of 67 peptides (15 amino acid residues) synthesized based on the sequence of the VZV immediately early (IE63) phosphoprotein. Control irradiation efficacy by monitoring the absence of visible signs of cytopathic effects after 4 days in PBMC cultures. Prepare all wells in duplicate. Add to the wells, one drop at a time, 100 μl of cells prepared in step 5.4 to the appropriate wells. Two wells should be left without cells (negative control). Incubate for 20 hr at 37 °C under a 5% CO2 atmosphere in a water jacket incubator. Do not shake, move, or stack the plates on top of one another during incubation. Discard the cells and wash the plates 10x with 1x PBS supplemented with 0.05% (v/v) Tween 20 (PBST). Tween 20 helps detach cells that have adhered to the PVDF membrane following overnight incubation. Using a multichannel pipette, add 100 μl of 0.5 mg/ml biotin conjugated anti-IFN-γ monoclonal antibody (4S.B3 clone) diluted in 1x PBS containing 0.5% (w/v) bovine serum albumin (BSA). Incubate plates for 2 hr at room temperature. Wash the wells 6x with PBST and add each well 100 μl of streptavidin conjugatd with alkaline phosphatase diluted 1:1,000 in 1x PBS containing 0.5% (w/v) BSA. Cover the plates and incubate for 1 hr at room temperature. Wash the plates 3x with PBST and 3x with 1x PBS. Add 100 μl of a 5-bromo-4-chloro-3-indolyl phosphate (BCIP)/nitro blue tetrazolium chloride (NBT) substrate solution and incubate 5 min at room temperature. Wash the plates under running distilled water. Remove the bottom section of the ELISpot plate and wash both sides of the membrane with distilled water. Air dry the plates. Examine the wells and enumerate the spots using a stereoscopic dissection microscope or scan the plates using an automated spot counter. Keep the plates away from light if they cannot be examined on the same day. Average the numbers of spots counted in corresponding duplicate wells and subtract the number of spots counted in the negative control wells (no cells) from the number of spots counted in the test wells. Express IFN-γ production as the number of spot-forming units (SFU) per 106 PBMC. Consider that test samples are positive if the number of SFU is >50 per 106 PBMC and 2 standard deviations (SD) above the negative control (cells + AIM-V medium supplemented with 2% (v/v) IHS). Use a value of 400 SFU per well when spots are too numerous to be counted. Test whether ELISpot data are normally distributed or not using the Kolmogorov-Smirnov test. When data are normally distributed, perform statistical comparisons using Student’s t test (2 groups) or ANOVA and the Bonferroni post-test (multiple comparisons). If data are not normally distributed, use the Mann-Whitney U test (2 groups) or the Kruskal-Wallis test and Dunn’s post-test (multiple comparisons). The IFN-γ ELISpot protocol detailed above was developed and optimized in our laboratory to measure the magnitude and the quality of cell mediated immune responses directed against VZV4. Diverse sources of VZV antigen can be used for the stimulation step. 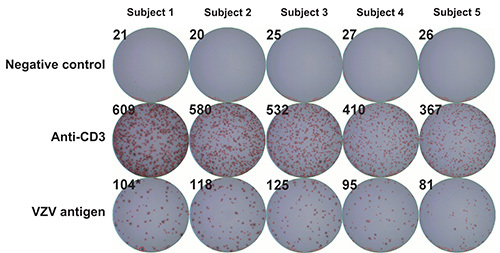 These include: a) commercially available detergent inactivated extracts from VZV infected Vero cells18; b) pools of overlapping synthetic peptides from specific VZV encoded proteins, including IE6315 and ORF419; c) live attenuated varicella zoster vaccine20; and d) UV inactivated preparations of VZV antigens from the supernatant of disrupted VZV infected MRC cells14. In our case, dilutions of live attenuated VZV vaccine were preferred over cell culture derived VZV in order to insure uniformity in antigen source and preparation and to limit culture and manipulation of live wildtype VZV strains in a clinical setting where nosocomial transmission is a serious concern10. In addition, γ irradiation was preferred over UV inactivation21 because of the comparative precision with which doses of γ radiation can be delivered and because, unlike UV, γ-rays efficiently penetrate sealed VZV containing vials. 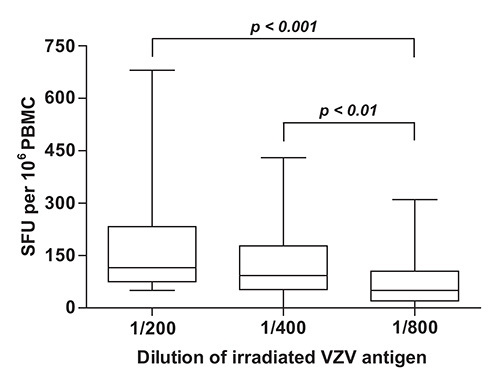 Irradiation of viral stocks led to consistently higher estimates of the frequency of VZV specific IFN-γ producing cells in PBMC samples obtained from a healthy donor at all dilutions of VZV antigen tested (Figure 1). This is possibly the result of the mitigation of cytopathic effects induced by live attenuated VZV in cell culture. To determine which dilution VZV antigen yielded maximal readouts in terms of numbers of SFU per 106 PBMC, IFN-γ ELISpot was performed using two-fold dilutions of γ irradiated live-attenuated VZV vaccine and PBMC samples obtained from a group of immunocompetent children aged between 9 months and 12 years who had a documented history of varicella and/or a positive serology for VZV (n = 50). Study subjects were enrolled at the Infectious Diseases Clinic and Special Immunology Clinic of CHU Sainte-Justine between June 2007 and September 2009. Statistically significant differences were observed between median frequencies of IFN-γ producing cells that were obtained using the 1:200, 1:400 and 1:800 dilutions of VZV antigen (p < 0.0001, Kruskal-Wallis test) (Figure 2). These disparities were accounted for by the difference between the 1:200 dilution (median = 115.0 SFU per 106 PBMC; interquartile range [IQR] = 75.0 - 232.5 SFU per 106 PBMC) and the 1:800 dilution (median = 50.0 SFU per 106 PBMC; IQR = 20.0 - 105.0 SFU per 106 PBMC), and between the 1:400 dilution (median = 92.5 SFU per 106 PBMC; IQR = 52.5 - 177.5 SFU per 106 PBMC) and the 1:800 dilution (p < 0.001 and p < 0.01, respectively, Dunn’s multiple comparisons test) (Figure 2). For this reason, the 1:200 dilution of γ irradiated live-attenuated VZV vaccine was selected for use in routine measurements of VZV specific cell mediated immune responses. To determine whether IFN-γ production resides in CD4+ and/or CD8+ T lymphocyte subsets, PBMC samples obtained from a healthy donor were subjected to depletion of CD4+ or CD8+ cells using anti-CD4 or anti-CD8 antibody coupled magnetic beads according to the manufacturer’s instruction. 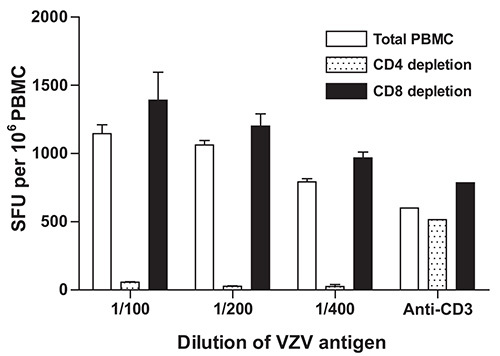 In concordance with previously published reports22,23, depletion of CD4+ cells resulted in a striking reduction in the frequencies of IFN-γ producing cells that were obtained using the 1:100, 1:200 and 1:400 dilutions of VZV antigen, while depletion of CD8+ cells did not lead to such a reduction and positive controls (stimulation with anti-CD3 monoclonal antibody) were not similarly affected (Figure 3). These results suggest that the majority of cells that produce IFN-γ in response to stimulation with VZV antigens are CD4+ T cells. Alternatively, these results could stem from depletion of CD4+ antigen presenting cells (i.e. monocytes, dendritic cells) from the PBMC pool, leading to reduced levels of presentation of VZV antigens to responder CD8+ T lymphocytes. The use of irradiated VZV is unlikely to have contributed to the skewing of the response towards CD4 dominance, as similar results were obtained by other groups using different techniques and antigen sources14,21,22. A low magnification micrograph of representative ELISpot wells is presented in Figure 4. High background/Poorly-defined or confluent spots High numbers of dead cells. Assess cell viability before culture set-up and stimulation. Inadequate membrane pre-wetting steps. Make sure to respect pre-wetting time and that membrane turn to gray after 1 min. 35% ethanol should be prepared immediately before use. Plates moved during the incubation period. Do not move plates to avoid poorly-defined snail trail spots. Wash steps. Manual wash is more efficient than plate washers. Formation of protein aggregates. Filter both capture and detection antibodies to reduce background and false positive spots. Secondary and detection antibody concentration. Adjust biotinylated secondary/detection antibody concentration to reduce background. Cold developing reagents. Bring substrate to room temperature to avoid underdevelopment. No spots/Blank wells Poorly defined spots. Do not stack plates during incubation period to have a homogeneous temperature in the different wells. Stimulation substrate not well prepared. Bring the peptide mixture aliquot to room temperature for 15 min to avoid crystal formation. Cell clumping. Resuspend cells into single-cell suspension to avoid underestimation of spot-forming units. Cells not stimulated appropriately. Use a polyclonal activator as a positive control. Inhibition of enzyme reaction by tween-20. Wash plates with PBS before adding BCIP/NBT substrate solution. Wrong antibody pairs. Make sure that the capture and detection antibodies react with different antigenic epitopes. Figure 1. Effect of γ-irradiation of live inactivated VZV vaccine on the frequency of IFN-γ producing cells as determined using IFN-γ ELISpot. VZV specific IFN-γ ELISpot was performed as described under Protocol Text using PBMC from a control volunteer and serial dilutions of γ irradiated (10,000 Gy) live attenuated VZV vaccine as antigen. Data represent the mean of duplicate measurements and error bars represent the standard error of the mean. PBMC: peripheral blood mononuclear cells; SFU: spot forming units; VZV: varicella zoster virus. Figure 2. Quantification of VZV specific cell mediated immune responses in children with documented evidence of previous infection with VZV. VZV specific IFN-γ ELISpot was performed as described under Protocol Text using PBMC isolated from subjects with a history of varicella (n = 50) and serial dilutions of γ irradiated (10,000 Gy) live attenuated VZV vaccine as antigen. Horizontal lines represent the median, boxes represent interquartile range (IQR), and whiskers represent the range of values. PBMC: peripheral blood mononuclear cells; SFU: spot forming units; VZV: varicella zoster virus. Figure 3. Effect of depletion of CD4+ or CD8+ cells on the frequency of IFN-γ producing cells as measured using IFN-γ ELISpot. Depletion of CD4+ or CD8+ cells and VZV specific IFN-γ ELISpot were performed as described under Protocol Text using PBMC from a control volunteer and serial dilutions of γ irradiated (10,000 Gy) live attenuated VZV vaccine as antigen. Data represent the mean of duplicate measurements and error bars represent the standard error of the mean. PBMC: peripheral blood mononuclear cells; SFU: spot forming units; VZV: varicella zoster virus. Figure 4. Representative ELISpot wells. VZV specific IFN-γ ELISpot was performed as described under Protocol Text using PBMC from five control volunteers and serial dilutions of γ irradiated (10,000 Gy) live attenuated VZV vaccine as antigen. First row: negative controls (AIM-V medium supplemented with 2% (v/v) IHS); second row: positive controls (anti-CD3 monoclonal antibody); third row: VZV antigen. Numbers in the upper corners represent SFU per well as measured using an automated spot counter. PBMC: peripheral blood mononuclear cells; SFU: spot forming units; VZV: varicella zoster virus; IHS: inactivated human serum. Modifications and troubleshooting: IFN-γ ELISpot assays have been used to examine cell-mediated immune responses directed against a variety of microbial pathogens, including human immunodeficiency virus type 1 (HIV-1)24,25, hepatitis C virus (HCV)26,27, and Mycobacterium tuberculosis28,29, just to name a few. Here we described the development of an IFN-γ ELISpot assay to measure cellular immunity against, with the hope of defining correlates of VZV specific immune reconstitution in recovering pediatric UCBT recipients. Key characteristics of this assay are four-fold. First, it does not require prior in vitro expansion of T cells, which is time consuming. Second, it can be performed using cryopreserved PBMC samples, which is best to minimize interassay variability. In addition, cryopreservation and parallel processing are well adapted to longitudinal studies, which require that samples be processed in batches. Third, to prevent cell clumping encountered during thawing of PBMC, treatment with an ultrapure genetically engineered endonuclease from Serratia marcescens was used. Cell clumping upon thawing PBMC occurs more frequently when using blood samples that are left overnight at room temperature before processing. The incorporation of genetically engineered endonuclease from Serratia marcescens is known not to affect cell viability, expression of cell surface markers and response to stimulation with cognate antigen in terms of SFU since low levels of nuclease are used and the duration of exposure is short22. 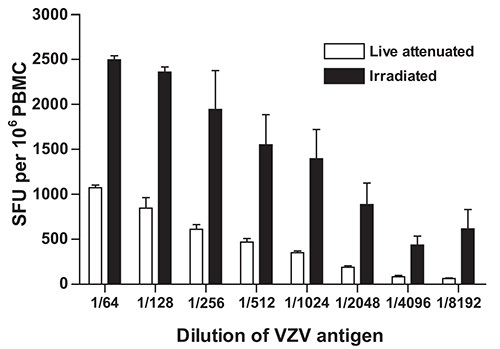 Fourth, γ irradiated live attenuated VZV vaccine was used to stimulate PBMC. It was preferred over cell culture derived VZV in order to insure uniformity in antigen dose and preparation and to overcome the need for manipulating live VZV in a clinical setting where the safety of patients and laboratory personnel is a major concern. Taken together, the modifications that were introduced in the VZV-ELISpot assay were intended to make it better adapted for use in a clinical environment. Limitations of the technique significance with respect to existing methods: Straightforward, sensitive and reproducible methods are required in order to measure host cell mediated immune responses directed against microbial antigens in the context of clinical followup. IFN-γ ELISpot is a robust, reproducible and informative assay that can be performed on venous blood samples using relatively low tech equipment (centrifuges, incubators, dissection microscope). However, it does not readily permit the simultaneous detection of multiple cytokines and cell surface markers. Traditional in vitro T cell proliferation assays, which have classically been used for the enumeration of CD4+ and CD8+ antigen specific T cell responses, are labor intensive, lack sensitivity and tend to suffer from a high degree of interassay variability30,31. On the other hand, cytotoxic T lymphocyte assays (CTL) based on the lysis of autologous targets loaded with 51Cr and limiting dilution analysis tend to depend on time consuming in vitro expansion steps to quantify antigen specific CD8+ T cells that are present at a low precursor frequencies32,33. Flow cytometry based assays that measure cytokine secretion following antigenic stimulation (intracellular cytokine staining [ICS])34,35 can also be used to characterize antigen-specific immune responses. ICS permits the simultaneous detection of cytokine production and cell surface expression of phenotypic markers in single cells. The sensitivity of ICS compares to that of ELISpot, but it requires larger numbers of cells36,37. Methods that make use of fluorescent class I or class II peptide-major histocompatibility complex (pMHC) oligomers (pMHC tetramers)38-40 are precise and enable multiparametric characterization of lymphocyte subsets based on expression of cell surface markers. However, pMHC tetramer staining requires prior knowledge of the patients’ human leukocyte antigen (HLA) type, which can be cumbersome and limit patient enrolment into a given study. Another limitation of this technique is that pMHC tetramer staining primarily allows the detection of T cells expressing medium to high affinity T cell receptors (TCR)41. On the other hand, CD8+ T cells expressing low affinity TCRs that are not stained by pMHC tetramers can be readily detected using IFN-γ ELISpot41. In addition, pMHC tetramers can bind to so-called exhausted CD8+ T lymphocytes that are prevalent in chronic viral infections42,43, thereby skewing the functional assessment of antigen specific cell mediated immune responses. Finally, pMHC tetramer staining and ICS typically require highly trained personnel, comparatively expensive reagents, sophisticated instruments, and dedicated facilities, making these techniques notoriously difficult to implement in a clinical follow up setting. Future applications: Dual color ELISpot assays capable of simultaneously detecting the production of both IFN-γ and IL-244 and dual- and triple-color fluorospot methods45 have generated significant interest, as they allow the assessment of the polyfunctionality of antigen specific T lymphocytes, which is an important feature of efficient cell mediated immune responses46. Critical steps within the protocol: Additional technical issues must be given careful consideration. Because many variables might affect spot quality (i.e. size and density) and number, adherence to the protocol is essential to achieve sensitive and reproducible results. The consistent use of specific brands of monoclonal antibodies (capture and detection), ELISpot plates with PVDF membranes, and 35% ethanol for membrane treatment prior to coating is of high importance. For example, overtreatment with ethanol can affect the performance of the assay and spot quality. To prevent obtaining uninformative wells (i.e. >300 spots), we recommend using no more than 2 x 105 PBMC per well. When faced with low frequencies of antigen specific T cells, assay sensitivity can be enhanced by prestimulating cells in vitro with cognate antigen or expand them with polyclonal activators such as phytohemagglutinin (PHA) for a defined period of time (typically 3-7 days)38. However, the final optimized procedure for the VZV ELISpot assay presented herein does not include in vitro prestimulation and/or expansion steps. Number and quality of spots were similar over an incubation range of 16-21 hr. Beyond 21 hr of incubation, spots were often more diffuse and sometimes overlapped, making their enumeration more difficult. Moreover, moving the plates while the cells are incubating can lead to poorly defined snail trail spots that are likewise more difficult to count. Additional troubleshooting cues are provided in Table 1. When using an automated spot counter, sensitivity and spot size gating are set using positive control (anti-CD3 monoclonal antibody) and negative control (AIM-V medium supplemented with 2% (v/v) IHS). The important characteristics to consider during spot enumeration are size and shape (Figure 4). The former allows one to distinguish T cell derived cytokine spots from background spots that should be ignored. Spot number provides an estimate of the frequency of VZV specific T cells present in a given PBMC sample, while spot size reflects how much IFN-γ is produced by each individual cells. To our knowledge, this is the only IFN-γ ELISpot method that makes use of γ irradiated live attenuated VZV vaccine as antigen4. Panels of overlapping synthetic peptides (15-mers) have also been used as antigen, including mixture of peptides based on the amino-acid sequence of the VZV IE63 phosphoprotein. IE63 is highly immunogenic47 and appears to be crucial for viral infectivity and the establishment of latency48. IE63 specific T cells have been detected in healthy VZV seropositive donors15, which suggests that IE63 is an important target of cell mediated immunity directed against VZV. However, reactive cells were found to be largely CD4+ T cells15. The VZV IFN-γ ELISpot assay was previously used by our group to assess the VZV specific T cell responses in 28 children who underwent UCBT to treat neoplastic or inherited blood disorders4. Results that were obtained during the course of this study suggested that both CD4+ and CD8+ T cell subsets were implicated in IFN-γ production and that reconstitution of the naive CD8+ T cell compartment led to more robust VZV specific cell mediated immune responses in terms of IFN-γ production. Importantly, these results also showed that the detection of more than 150 SFU per 106 PBMC was consistent with T cell mediated protection against VZV infection or reactivation4. However, this threshold value for VZV specific cell mediated immunity in the context of UCBT and ensuing immune reconstitution or lack thereof will have to be validated in larger prospective multicenter studies. The authors wish to thank study participants and their parents. We would also like to thank Dr. Réjean Lapointe (CHUM Notre-Dame, Montreal, Canada) for access to his ELISpot reader, Dr. Lubo Alexandrov for statistical analysis, and Denis Blais, Sandra Caron, Silvie Valois and Martine Caty for expert technical assistance. Supported by grants from le Fonds d’opération pour les projets de recherche clinique et d’évalution des technologies (CHU Sainte-Justine) to H.S. and P.O., by la Fondation Centre de cancérologie Charles-Bruneau, and by the Leukemia & Lymphoma Society of Canada. I.S.F. was supported by scholarships from la Fondation CHU Sainte-Justine and le Fonds de la recherche du Québec-santé (FRQS). A.J.G. was the recipient of scholarships from the Department of Microbiology, Infectiology & Immunology, Université de Montréal (Gabriel-Marquis Scholarship), FRQS, and the Canadian Institutes of Health Research (CIHR). N.M. was supported by la Fondation CHU Sainte-Justine, the Cole Foundation, and FRQS. Leucocep tube VWR 89048-936/89048-932 12 ml or 50 ml tubes may be used depending on the volume of blood. Ficoll-Paque GE Healthcare 17-1440-02 Protect from light. Benzonase nuclease Novagen 70746-3 Keep at -20 °C. MultiScreenHTS-IP Filter Plate Millipore MSIPS4W10 Sterile with pore size of 0.45 µm. Mouse anti-human IFN-γ capture antibody BD Biosciences 551221 NIB42 clone. Pepmix VZV IE63 JPT Peptide Technologies PM-VZV-IE63 Dissolve contents of one vial in 40 μl of DMSO. Use within 6 months. Biotin-conjugated anti-IFN-γ monoclonal antibody BD Biosciences 554550 4SB3 clone. Streptavidin conjugated with alkaline phosphatase Bio-Rad Life Science 170-3554 Dilute for use on the same day. BCIP/NBT Bio-Rad Life Science 170-6432 Protect from light. Ballen, K. K., et al. Umbilical cord blood transplantation: the first 25 years and beyond. Blood. 122, (4), 491-498 (2013). Vandenbosch, K., et al. Varicella-zoster virus disease is more frequent after cord blood than after bone marrow transplantation. Biol. Blood Marrow Transplant. 14, (8), 867-871 (2008). Barker, J. N., et al. Serious infections after unrelated donor transplantation in 136 children: impact of stem cell source. Biol. Blood Marrow Transplant. 11, (5), 362-370 (2005). Merindol, N., et al. Reconstitution of protective immune responses against cytomegalovirus and varicella zoster virus does not require disease development in pediatric recipients of umbilical cord blood transplantation. J. Immunol. 189, (10), 5016-5028 (2012). Feldman, S., et al. Varicella in children with cancer: Seventy-seven cases. Pediatrics. 56, (3), 388-397 (1975). Arvin, A. M. Varicella-Zoster virus: pathogenesis, immunity, and clinical management in hematopoietic cell transplant recipients. Biol. Blood Marrow Transplant. 6, (3), 219-230 (2000). Wiegering, V., et al. Varicella-zoster virus infections in immunocompromised patients - a single centre 6-years analysis. BMC Pediatr. 11, 31 (2011). Boeckh, M., et al. Long-term acyclovir for prevention of varicella zoster virus disease after allogeneic hematopoietic cell transplantation--a randomized double-blind placebo-controlled study. Blood. 107, (5), 1800-1805 (2006). Boeckh, M. Prevention of VZV infection in immunosuppressed patients using antiviral agents. Herpes. 13, (3), 60-65 (2006). Tomblyn, M., et al. Guidelines for preventing infectious complications among hematopoietic cell transplantation recipients: a global perspective. Biol. Blood Marrow Transplant. 15, (10), 1143-1238 (2009). Ljungman, P., et al. Long-term acyclovir prophylaxis in bone marrow transplant recipients and lymphocyte proliferation responses to herpes virus antigens in vitro. Bone Marrow Transplant. 1, (2), 185-192 (1986). Selby, P. J., et al. The prophylactic role of intravenous and long-term oral acyclovir after allogeneic bone marrow transplantation. Br. J. Cancer. 59, (3), 434-438 (1989). Distler, E., et al. Recovery of varicella-zoster virus-specific T cell immunity after T cell-depleted allogeneic transplantation requires symptomatic virus reactivation. Biol. Blood Marrow Transplant. 14, (12), 1417-1424 (2008). Levin, M. J., et al. Decline in varicella-zoster virus (VZV)-specific cell-mediated immunity with increasing age and boosting with a high-dose VZV vaccine. J. Infect. Dis. 188, (9), 1336-1344 (2003). Jones, L., et al. Phenotypic analysis of human CD4+ T cells specific for immediate-early 63 protein of varicella-zoster virus. Eur. J. Immunol. 37, (12), 3393-3403 (2007). Czerkinsky, C., et al. Reverse ELISPOT assay for clonal analysis of cytokine production. I. Enumeration of gamma-interferon-secreting cells. J. Immunol. Methods. 110, (1), 29-36 (1988). Hutchings, P. R., et al. The detection and enumeration of cytokine-secreting cells in mice and man and the clinical application of these assays. J. Immunol. Methods. 120, (1), 1-8 (1989). De Castro, N., et al. Varicella-zoster virus-specific cell-mediated immune responses in HIV-infected adults. AIDS Res. Hum. Retroviruses. 27, (10), 1089-1097 (2011). Jones, L., et al. Persistent high frequencies of varicella-zoster virus ORF4 protein-specific CD4+ T cells after primary infection. J. Virol. 80, (19), 9772-9778 (2006). Malavige, G. N., et al. Viral load, clinical disease severity and cellular immune responses in primary varicella zoster virus infection in Sri Lanka. PLoS One. 3, (11), (2008). Sadaoka, K., et al. Measurement of varicella-zoster virus (VZV)-specific cell-mediated immunity: comparison between VZV skin test and interferon-gamma enzyme-linked immunospot assay. J. Infect. Dis. 198, (9), 1327-1333 (2008). Smith, J. G., et al. Development and validation of a gamma interferon ELISPOT assay for quantitation of cellular immune responses to varicella-zoster virus. Clin. Diagn. Lab. Immunol. 8, (5), 871-879 (2001). Ouwendijk, W. J., et al. T-cell immunity to human alphaherpesviruses. Curr. Opin. Virol. 3, (4), 452-460 (2013). Rowland-Jones, S. L., et al. Cytotoxic T cell responses to multiple conserved HIV epitopes in HIV-resistant prostitutes in Nairobi. J. Clin. Invest. 102, (9), 1758-1765 (1998). Alter, G., et al. Human immunodeficiency virus (HIV)-specific effector CD8 T cell activity in patients with primary HIV infection. J. Infect. Dis. 185, (6), 755-765 (2002). Lechner, F., et al. Analysis of successful immune responses in persons infected with hepatitis C virus. J. Exp. Med. 191, (9), 1499-1512 (2000). Fournillier, A., et al. A heterologous prime/boost vaccination strategy enhances the immunogenicity of therapeutic vaccines for hepatitis C virus. J. Infect. Dis. 208, (6), 1008-1019 (2013). Adetifa, I. M., et al. Interferon-γ ELISPOT as a biomarker of treatment efficacy in latent tuberculosis infection: a clinical trial. Am. J. Respir. Crit. Care Med. 187, (4), 439-445 (2013). Lalvani, A., Pareek, M. A 100 year update on diagnosis of tuberculosis infection. Br. Med. Bull. 93, 69-84 (2010). Berger, R., et al. A dose-response study of a live attenuated varicella-zoster virus (Oka strain) vaccine administered to adults 55 years of age and older. J. Infect. Dis. 178 Suppl. 1, (1998). Trannoy, E., et al. Vaccination of immunocompetent elderly subjects with a live attenuated Oka strain of varicella zoster virus: a randomized, controlled, dose-response trial. Vaccine. 18, (16), 1700-1706 (2000). Brunner, K. T., et al. Quantitative assay of the lytic action of immune lymphoid cells on 51-Cr-labelled allogeneic target cells in vitro; inhibition by isoantibody and by drugs. Immunology. 14, (2), 181-196 (1968). Moretta, A., et al. Quantitative assessment of the pool size and subset distribution of cytolytic T lymphocytes within human resting or alloactivated peripheral blood T cell populations. J. Exp. Med. 158, (2), 571-585 (1983). Jung, T., et al. Detection of intracellular cytokines by flow cytometry. J. Immunol. Methods. 159, (1-2), 197-207 (1993). Maecker, H. T., et al. Standardization of cytokine flow cytometry assays. BMC Immunol. 6, 13 (2005). Nomura, L., et al. Standardization and optimization of multiparameter intracellular cytokine staining. Cytometry A. 73, (11), 984-991 (2008). Letsch, A., Scheibenbogen, C. Quantification and characterization of specific T-cells by antigen-specific cytokine production using ELISPOT assay or intracellular cytokine staining. Methods. 31, (2), 143-149 (2003). Merindol, N., et al. Umbilical cord blood T cells respond against the Melan-A/MART-1 tumor antigen and exhibit reduced alloreactivity as compared with adult blood-derived T cells. J. Immunol. 185, (2), 856-866 (2010). Scriba, T. J., et al. Ultrasensitive detection and phenotyping of CD4+ T cells with optimized HLA class II tetramer staining. J. Immunol. 175, (10), 6334-6343 (2005). Stone, J. D., et al. Interaction of streptavidin-based peptide-MHC oligomers (tetramers) with cell-surface TCRs. J. Immunol. 187, (12), 6281-6290 (2011). Pantaleo, G., et al. Evidence for rapid disappearance of initially expanded HIV-specific CD8+ T cell clones during primary HIV infection. Proc. Natl Acad. Sci. USA. 94, (18), 9848-9853 (1997). Wherry, E. J. T cell exhaustion. Nat. Immunol. 12, (6), 492-499 (2011). Boulet, S., et al. A dual color ELISPOT method for the simultaneous detection of IL-2 and IFN-gamma HIV-specific immune responses. J. Immunol. Methods. 320, (1-2), 18-29 (2007). Ahlborg, N., Axelsson, B. Dual- and triple-color fluorospot. Methods Mol. Biol. 792, 77-85 (2012). Precopio, M. L., et al. Immunization with vaccinia virus induces polyfunctional and phenotypically distinctive CD8(+) T cell responses. J. Exp. Med. 204, (6), 405-1416 (2007). Sadzot-Delvaux, C., et al. Recognition of the latency-associated immediate early protein IE63 of varicella-zoster virus by human memory T lymphocytes. J. Immunol. 159, (6), 2802-2806 (1997). Malavige, G. N., et al. IE63-specific T-cell responses associate with control of subclinical varicella zoster virus reactivation in individuals with malignancies. Br. J. Cancer. 102, (4), 727-730 (2010).